Rinse the okra in cold water and pat dry with a kitchen towel or allow to air dry for an hour.Cut off the top and cut each Okra in 4 strips.Transfer in a large mixing bowl and combine with all the spices ,oil and salt. 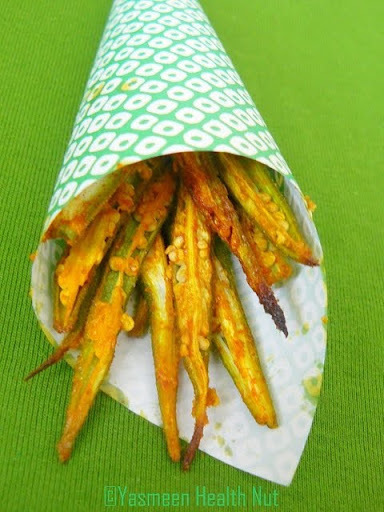 Preheat Oven to 375F.Lay the okra on a baking sheet,spread evenly and prevent any overlapping.Keep a close eye on them,as these can burn easily.Bake for 8-10 minutes until crisp.Serve warm with hot Cuppa chai. Oh so delicate Lady's fingers, crispy and yummy. Great to munch on winter days with coffee. What an original recipe! They must taste wonderful! Awesome fries. You are right about the name. Lady's fingers sounds much better than Okra. Great presentation as always. 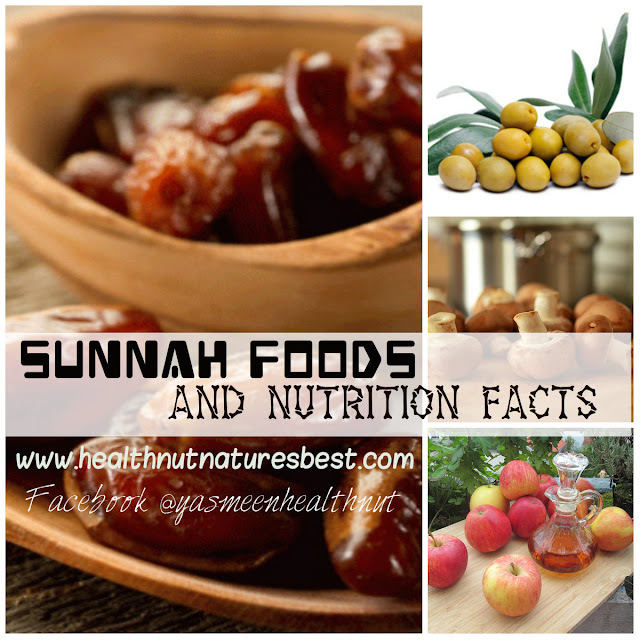 wow these looks delicious..my favorite snack..i just shallow fry with very little oil.. The fries looks yummy...nice click ! How absolutely delicious. I love okra. It is one of my favorite veggies! That sounds very eays and yummy but will the okras get cooked in just 8 to 10 mins? So this is the time that I will be liking the okra thing. I hope I will find it yucky. hummm, looks crispy, hot and crunchy and delicious!! 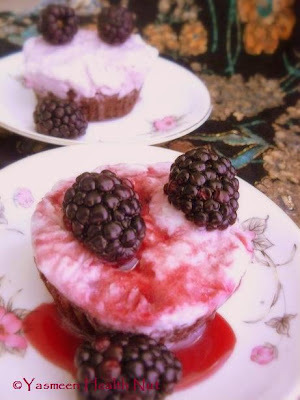 great idea baking them!! Looks crispy, colorful and crunchy!!! I have been searching on ebay for a good book to help me with my diet. In the end I googled it and found this site http://www.hungryforweightloss.com. ummm i want tm now,..
Yasmeen, I love the way you served the ladies fingers in a paper cone! Brilliant! Oh my word, that looks sensational! It is really hard to get Lady's fingers here in Australia but I am going to try my hardest so I can give this a go! Thanks for visiting my blog too and for your lovely comment-so nice to "meet' you! My family favorite! U have made so perfect and nice click too! Seeing these kind of posts reminds me of just how technology truly is ever-permeating in this day and age, and I am fairly certain that we have passed the point of no return in our relationship with technology. I don't mean this in a bad way, of course! Societal concerns aside... I just hope that as the price of memory falls, the possibility of downloading our memories onto a digital medium becomes a true reality. It's one of the things I really wish I could encounter in my lifetime. these are so good. I love fried okra, never tried it sliced , been told that it will bleed if cut. Have to try your recipe and compate. 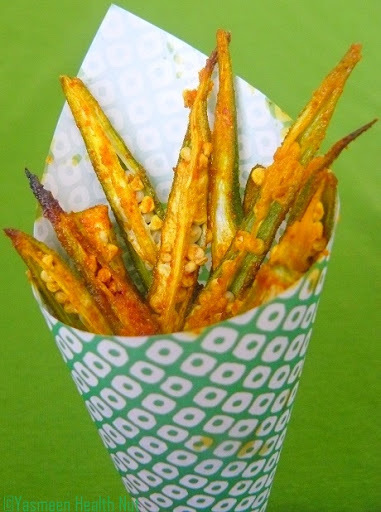 Wow much healthier than potato fries.Very interesting use of okra. 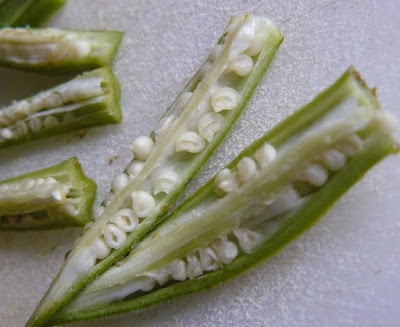 Wow..that is such a different way to make Okra! Will definitely try it someday as that's one of my fav. veg these days! So delicate and refined and yet so good! Pefect. I will be trying this as soon as I get some okra sprouting in by backyard! Thanks for the wonderful idea! Oh how this makes me long for okra season! Yum. I am definitely saving this! 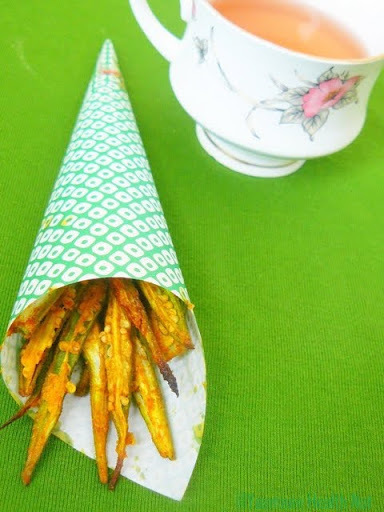 wow, what lovely presentation..love this crispy okra.. I actually made the recipe tonight with fresh okra I had on hand. Spices were perfect. Okra krispy. Double what you think you want for dinner. These babies really shrink. Ate with my fingers. Can't wait for more. I have leftover okra. Thinking lunch tomorrow. Tried this today...it didn't get crispy even at 15 mins. How long should it be in the oven ?